"Rainbow Cabaret" is the Fresh and Ravishing Las Vegas Show That Pays Homage to Hollywood's Unforgettable Mother-Daughter Icons – Judy Garland and Liza Minnelli. 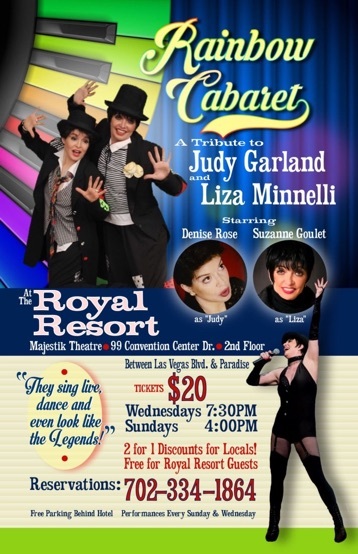 Starring Denise Rose as Judy and Suzanne Goulet as Liza, This Brilliant Song and Dance Spectacle is Not to be Missed at the Royal Resort's Majestik Theatre. LAS VEGAS - Jan. 24, 2017 - PRLog -- The stars shine bright once again at Royal Resort's enchanting Majestik Theatre. 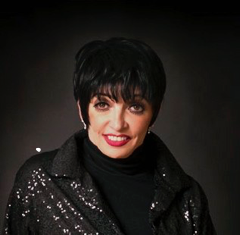 Presented in an eclectic, intimate setting, "Rainbow Cabaret" brings convincing authenticity into re-creating the experience of seeing Judy Garland with her daughter Liza Minnelli up close and personal. While appearing as if they'd been reunited at their peak, Denise Rose as Judy and Suzanne Goulet as Liza have the looks, the voices and the remarkable dancing ability to make this engaging fantasy come true. The reviews are predictably fabulous. Suzanne & Denise have a record of excellent reviews and standing ovations for all of their performances – in theaters, cruise ships, country clubs and casinos all over the US. Some of the notable casinos to their credit are the Las Vegas Suncoast Casino, The Tropicana in Atlantic City, Harrah's in St-Louis and Foxwoods Resort Casino in Connecticut. Some of the major theaters where they have performed are The Norris Center in California, Coral Beach Performing Center in Florida, Westchester and Westbury theaters of New York, The El Portal Theater in Los Angeles, And The Stranaham Theater in Ohio – just to name a few.